Control of the brown dog tick (Rhipicephalus sanguineus) and Ixodes ricinus as well as fleas (Ctenocephalides canis/felis) in dogs. KILTIX Collar should be loosely fitted around the neck of the dogs. 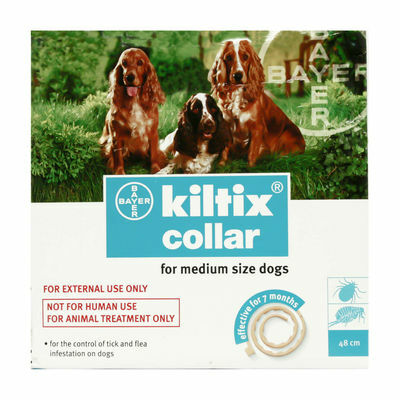 Use KILTIX Collar – Large or Medium as per the body weight of the dog. Each KILTIX Collar would protect from ticks and fleas for around 6 – 7 months.